Here is the occupational hazard of being a wedding photographer. . . I get so many ideas that I wish I could go back and do my wedding all over again. I got married before the dawn of Pinterest, which was probably a good thing, or I’d still be sitting here folding hundreds of origami cranes (or something like that!) I want to share with you some amazing weddings details that are a reflection of the couples who created them. Table numbers or markers can be an amazing opportunity to express who you are as a couple. 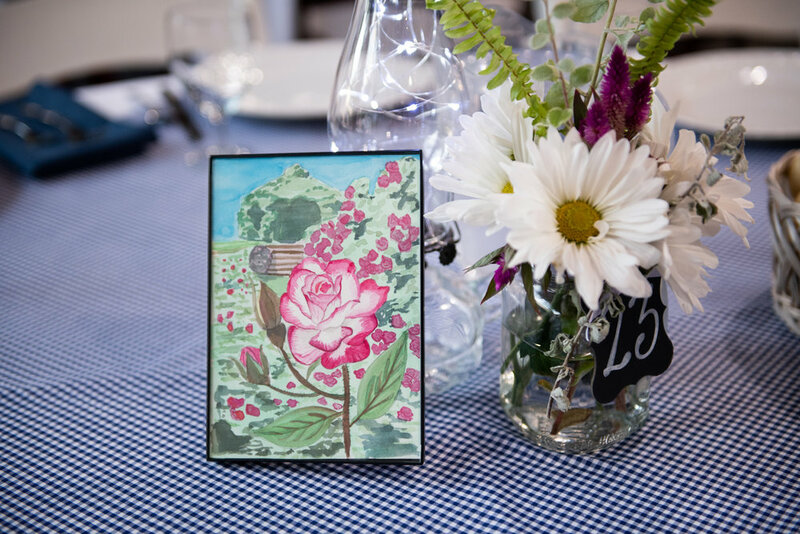 Check out how this bride/art teacher/painter by trade created unique table markers. Each table is represented by a different iconic symbol from our state of Connecticut. The food at your wedding blows me away! Just looking at these photos while editing makes me hungry! Here are just two amazing ideas to make your food memorable. I think a whole blog post about food is in order. A variety of desserts! Yum! Pizza is definitely the most amazing idea. A lot of the couples I work with, well over 1/2 of them, bring their dog to at least one part of the wedding day. There are services who will come pick up your dog after the ceremony or bring him/her to any part of your day to be in photos. I mean what could be more special than a photo with your furry baby on your wedding day? Pet Taxis to your wedding from West Hartford start at $100. or find a local college student. http://westhartfordpetsitters.com/pet-care-rates/ You will be so happy you did! Add photos of those people who you wish could be by your side but are in your heart instead. I saved the best for last! Music is by far the one thing that will add so much personality to your wedding and make it the party of your lifetime! From a harpist, to a mariachi band, to the bride or groom singing their vows, I have seen the most beautiful expressions of love through music.